Beirut- While Syria’s opposition has cautiously dealt with the Russian-U.S. deal concerning a national ceasefire in Syria expected to start Sunday midnight, the regime of Bashar Assad attacked residential areas in Aleppo and Idlib, leaving more than 85 killed and injured civilians who were preparing to celebrate the Eid. A source at the SNC told Asharq Al-Awsat newspaper that the Syrian regime is expected to increase its military operations in the next remaining hours ahead of the start of the national ceasefire. The source said that the Russians will prevent the Syrian regime jets from participating in attacks launched against Aleppo to prove they respect the agreement reached with Washington and therefore, be capable after seven days to move to the second stage of the deal. “The regime still has some targets it plans to attack during these two days, particularly in Aleppo,” the source added. 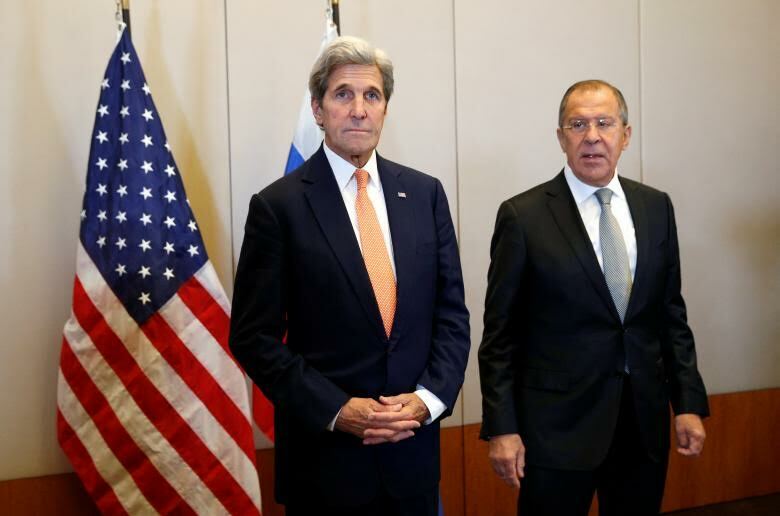 The Syrian regime had already announced it accepts the Russian-U.S. deal. “The Syrian government has approved the agreement, and a cessation of hostilities will begin in Aleppo for humanitarian reasons,” said Syria’s state-run media outlet, SANA. But, the High Negotiations Committee (HNC) said it feared that the Russian-U.S. deal would be enforced on the opposition to benefit the regime, the official spokesman of the HNC Riad Nassan Agha said. Meanwhile, the military opposition doubted that the ceasefire agreement would succeed, saying that the regime of Bashar Assad would not abide by it. A commander at the Free Syrian Army told Asharq Al-Awsat that opposition factions would not respect the deal. The new deal stipulates that the Syrian government would not fly combat missions in an agreed area. It also asks the opposition to halt fighting as a confidence building measure. If the ceasefire works, Russia and United States will begin seven days of preparatory work to share information and launch joint aerial attacks on selected positions. On Saturday, opposition factions had surprisingly launched the “South al-Qadisiyah battle.” In the province of Kunaytra, several factions including Ahrar al-Sham, Jubhat Fateh al-Sham and factions linked to the Free Syrian Army had announced they had controlled strategic areas. In Ankara, Turkey’s Foreign Ministry said in a statement that Ankara would deliver aid through the United Nations to the northern Syrian city of Aleppo. The ministry said it was pleased with the deal to reach a ceasefire in Syria. “We welcome the Russian-U.S. agreement aimed at halting the fighting in Syria and delivering humanitarian aid,” the Foreign Ministry said. It added the agreement is “critical” for ending the fighting throughout Syria, and specifically Aleppo. Earlier, Turkish Foreign Minister Mevlut Cavusoglu said the establishment of a no-fly zone over northern Syria was very important, adding that such a move requires a decision from the U.N. Security Council and not the NATO. “The U.S. Security Council should take a decision for a no-fly zone,” Cavusoglu said. The minister was speaking after a meeting late Friday with NATO Secretary General Jens Stoltenberg in Ankara. He said the no-fly zone was important to maintain security of the areas cleared from ISIS and enable the safe return of refugees.